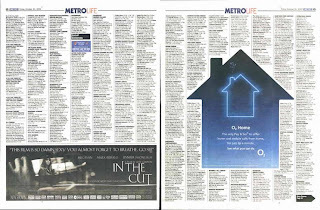 For O2's Home campaign we ran the cardboard house with the Evening Standard and we also adapted standard ads to enhance stand-out and communication of the 'Home' message. We worked with VCCP (the creative agency) and adapted ads so that they were actually house shaped - though the hardest part was to persuade newspapers to carry this shape! We were successful in getting this ad to run in a number of papers (and managed to persuade editors to run text all the way around the ads.) House shapes ran with Metro, Evening Standard and the Daily Star.